Credit Sesame is a free personal finance tool that analyzes your credit, mortgages loans, credit card debt and gives you a free credit score and complete picture of your credit and debt situation. You can monitor your credit, loans and debt all in one place. Credit Sesame’s free credit score is not a FICO score, it’s an estimate of the FICO formula that closely resembles the FICO score. Credit Sesame will tell your credit potential after you’ve entered your financial information like current debts, home value, debt, etc. 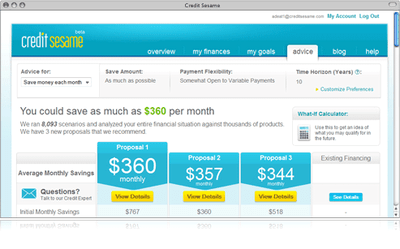 It’s free and creating an account is easy (no credit card required) – Visit www.creditsesame.com for more information. Next post: How do I Save Money on Gas?